People In The Sun (1960) by Edward Hopper. 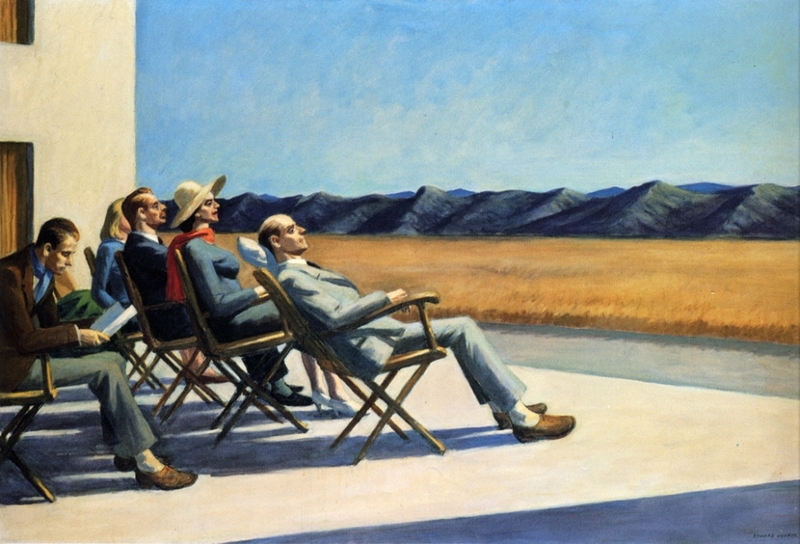 The precision of the staggered deckchairs and bands of colour indicating mountains, sky, and grass create an abstracted environment that veers between a real view and a stage set, as if Hopper were replaying a silent film of a family vacation. The canvas may reflect Hopper's discomfort in the West, where he found himself unable to paint with his usual enthusiasm when confronted by the harsh light and monumental landscapes. John Squire received an Edward Hopper calendar as a Christmas gift in 2002 and pinned it up in the room that he used to write in. He found Hopper's 'People In The Sun' so striking that he set myself a challenge to see if he could write a song around the image. This led to him writing 12 songs altogether, based on the respective painting for each month (11 are found on the album, with Nighthawks being released as a b-side). In People In The Sun, four figures - one of which is faceless - gaze into the sun, while the younger man situated behind them contentedly reads, holding his book in the shadow to reduce the glare. The stark lighting and cool colours emphasize the eerie expressions, frozen poses, and formal attire of the figures, as they sit on a terrace beneath a vast blue sky. The aligned figures might be mannequins; the detached younger man is unquestionably alive. Of the five people, only he is hunched over, wearing a muffler, the colour of which matches the blue of the most distant hills and the blonde lady's dress. They suggest a group of tourists who feel obliged to take in a famous scenic view, but do so with little pleasure. Hopper distilled his memories of tourist destinations in the American West to create a scene that is strangely familiar, but nowhere in particular. The landscape is peculiar - a road, a square-cut field of grain, a low range of blue-grey hills, like waves in the ocean. The juxtaposition of flat field and stony hills, the divide between which forms the bald gentleman's line of vision, is as unexpected as men in suits and women in dresses seated in wooden deck-chairs. The setting is almost like that on the deck of a cruise ship, with its passengers intently watching the waves. Hopper's People In The Sun demonstrates a variant of the realism that has dominated much of American art. His paintings were always spare, and as his work progressed, sunlight and large, empty spaces assumed more and more importance.